John Delaney may have started his football life as a volunteer but since rising to the top of the FAI ranks, he has been handsomely rewarded for his contribution to the game. His most ardent supporters came out and backed him last week. Some claimed the €360,000 he most recently earned as FAI chief executive was not enough for the time he had dedicated to the “family of football”. Outside of football, Delaney has a number of interlinked business interests that he has kept going alongside his role in the FAI. He owns two-thirds of an Athlone-based furniture business which made a loss of more than €30,000 during its 2018 financial year. That meant retained losses at the firm rose to €72,154 for the year. Previous accounts, for the year to the end of March 2017, noted that Delaney “has confirmed that he is willing to provide financial support to the company for the foreseeable future sufficient to allow the company to continue as a going concern”. Unlike previous years, the most recent set of accounts, for the year to the end of March 2018, were unaudited and abridged after the appointment of the company’s long-time auditor, Spain, Fewer, Quinlan & Co, was terminated by agreement in August 2017. Correspondence filed to the Companies Registration Office by the auditor noted that the directors of Gerfurn – of which Delaney is one – decided to avail of an exemption under company law to prepare accounts under the micro-entities regime, as it was entitled to do. That provision allows companies below a certain size to publish a less detailed set of accounts, which, for example, does not give details of directors’ remuneration or of loans to or from directors. Accounts for the financial year 2017 showed that Delaney had loaned the company just under €40,000, with €9,780 repaid by the company to him during the year. Earlier accounts showed that an internet cafe in Athlone – also two-thirds owned by Delaney and of which he was a director but which ceased trading in 2014 – owed Gerfurn €100,000. The accounts said that “an undertaking has been provided by the directors that they will independently introduce this amount”. At the end of 2017, the accounts showed that Gerfurn owed €352,436 to credit institutions, with Bank of Ireland continuing to hold a charge to two residential investment properties in the Castle Heights estate on the Co Tipperary side of Carrick-on-Suir that were bought by the company in 2007. Data from the residential property register shows that both of the Castle Heights houses were sold by the business in December 2017 and March 2018 for €127,500 and €140,000 respectively. Another company linked to the FAI boss, JMPHE, a building and property rental company, is reported to have built close to 50 of the houses on the Castle Heights estate 10 years ago. Delaney owns a 25pc share and acts as a director. Another director and shareholder in the building company is former Fine Gael councillor for Waterford, Hilary Quinlan, who stepped down from the board of Irish Water in 2014 after it emerged he was the ministerial driver of then Department of the Environment Minister for State Paudie Coffey. JMPHE, set up in 2003, had retained losses of €371,284, according to its latest annual accounts. The company owed Delaney €222,485 for the year ending February 2018 and had a bank loan of €268,023. Most recently, he earned €360,000 as FAI CEO. On top of this, the Sunday Times reported that the association paid €3,000 per month to rent a home for him and it is unclear what other benefits-in-kind he earned or expenses he was paid while in the post. Now that he has stepped aside to become the association’s executive vice-president, he will still be handsomely rewarded. 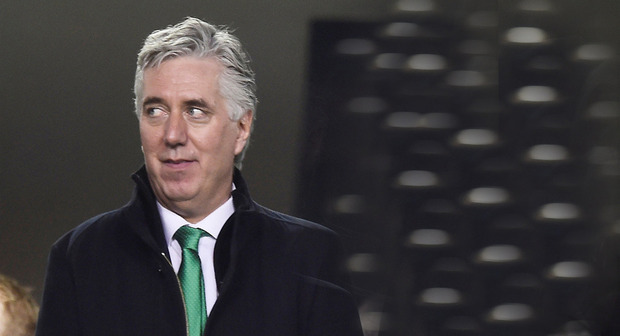 The FAI has refused to clarify his new salary, only saying it is substantially lower than the previous €360,000 sum. It has been reported that his new salary will be in the region of €120,000 but he once earned €450,000 as FAI chief executive before taking a pay cut in 2010. His salary remained at €400,000 before taking a further 10pc reduction in 2012 along with other FAI staff. There are those who feel he should earn more. What these statements and others supporting Delaney fail to point out is that he was working and being paid handsomely to carry out his role. He had other duties as chief executive but the majority of the praise afforded to him has focused on his ability to work with football’s foot soldiers. In his 14 years at the helm, Delaney earned in excess of €5,500,000 as chief executive. Breaking down this figure against the 2,000 grassroots events he attended shows Delaney justified €2,500 of his salary with every club visit. On top of this, Delaney has Uefa earnings that must be factored into his pay packet. He was elected to the Uefa executive committee in 2017 – a role that comes with an annual gross salary of €160,000 per year and some lucrative extras. The FAI said his 2018 Uefa salary will be donated to the association but Uefa said he receives other perks. “Executive committee members receive a daily allowance of €300 when on duty,” a Uefa spokesman told the Sunday Independent. These duties include attending meetings at Uefa’s Swiss headquarters. Generally, Uefa said, these take place every second month but increasingly they are organised to coincide with important football fixtures which the executives attend. This comes at no cost to the committee members.